Sensors galore: The golden age of engineering data? In the Autodesk File book, John Walker not only explains the Golden Age of Engineering, but proves he had in a hand in it, by giving the world’s architects and engineers an affordable instrument of creation; AutoCAD. Now I believe that due to recent phenomenon like the internet of things, augmented and virtual reality we are at the brink of another revolution, the golden age of “engineering data”. Mr Walker’s view in the late eighties was about new materials, semiconductors and microelectronics, which had grown exponentially since the 1960's. It made complicated systems possible, at low cost. This drove growth in computing technology, placing computers in the hands of all who want them. AutoCAD democratized design tools, which resulted in waves of innovation in engineering and architecture. Fast forward to 2015. Now jet engines (GE and RR) and cars have tons of sensors in them that tell owners and support services when and how to maintain them. Tesla provides car updates through Wi-Fi. Sheep and rivers get outfitted with sensors, in Conwy, Wales. While Google Glasses overlay the physical world with data, augmenting reality in the process, and Oculus Rift delivers solid virtual reality. The present cliché of glassed geeks who walk about browsing the web will soon be replaced by professional engineers, technicians, geologists and medical staff using smart glasses to inspect machines, buildings and constructions, along with animals, rivers and patients. Monitoring reality through tiny cameras and receiving immediate feedback and analysis, saves time and money which will only increase productivity, and fuel growth in this area. This is already starting to happen, but it is likely to become more pronounced as both global machine manufacturers as well as smart startups offer more niche products to monitor and feedback data on subjects ranging from buildings, topology, planes, humans, livestock and crops. Doctors will find diagnosis easier and better by wearing smart glasses, identifying afflictions through image recognition software, and having instant access to intelligent databases offering remedies and medication (be it sponsored by pharmaceutical companies, or not). Police agents and all kinds of inspectors will scan and identify every single object that is stored somewhere in some database, and offer immediate and appropriate responses. It will be just like Arnie in the first Terminator film, only smarter. There is also likely to be a vast switch over to virtual reality. Oculus Rift has proved it is finally possible, not just to overlay data, but to offer complete new virtual worlds. The entertainment industry will have a ball once the tech is robust enough, but I am thinking more about professional applications. Design is already evolving from drawing on paper to drawing on computers in two dimensions, then modelling in three dimensions. The next logical step will be creating and sharing in a virtual space. This will mean, instead of designing models on a flat screen, the designer will walk inside a building or machine, while creating it. And doctors will perform surgery while having a computer model rendering of what they are operating on, offering instant advice and risk assessment. 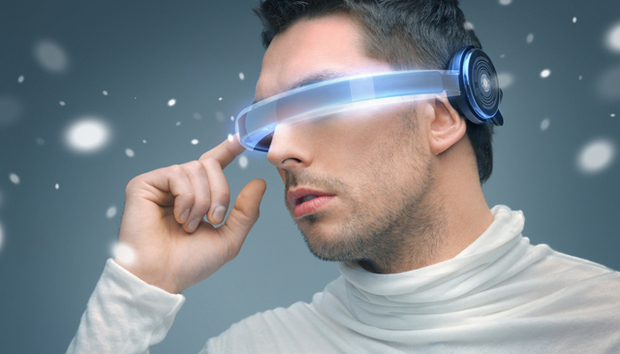 The possibilities for augmented and virtual reality are limited only by our imagination. The vision of the internet of things is exciting, but it’s only the beginning of a new golden age, the age of engineering data. All we need is fast and cool hardware, like improved versions of Google Glass and Oculus Rift, sensors-galore, lots of bandwidth and cheap storage coupled with imaginative software, and we will have the choice of three realities (actual reality, augmented or virtual) to live and work in. I only wonder what nicknames these respective ‘reality’ dwellers will eventually attract?